Each year, I throw a Christmas cocktail party. My apartment is small, so I don’t entertain as often as I would like to. This annual fete allows me to thank all of the people who’ve entertained me during the year. Clearly, since it’s a thank you, I want it to feel special, and nothing better says special to me than getting an invitation in the mail. BUT, they can be pretty expensive to produce. I use stamps make them look personal without adding to the cost. I pick up regular stock cards and matching envelopes from Paper Source for $4.95 for a pack of 25 cards and $3.25 for pack of 10 envelopes. For 30 party invites, that comes to $19.65 total plus $13.50 in postage. I run them through my printer to add the party details, and finish with a stamp on top. And viola! Apologies for the weird, white out line, but you get the idea. Cute, no? I’m hosting a bridal shower over the Christmas holiday for my dear friend who’s getting married next spring. I ordered the invitations from TinyPrints (a very reasonable site for printed invitations, especially when you have a coupon like this one). 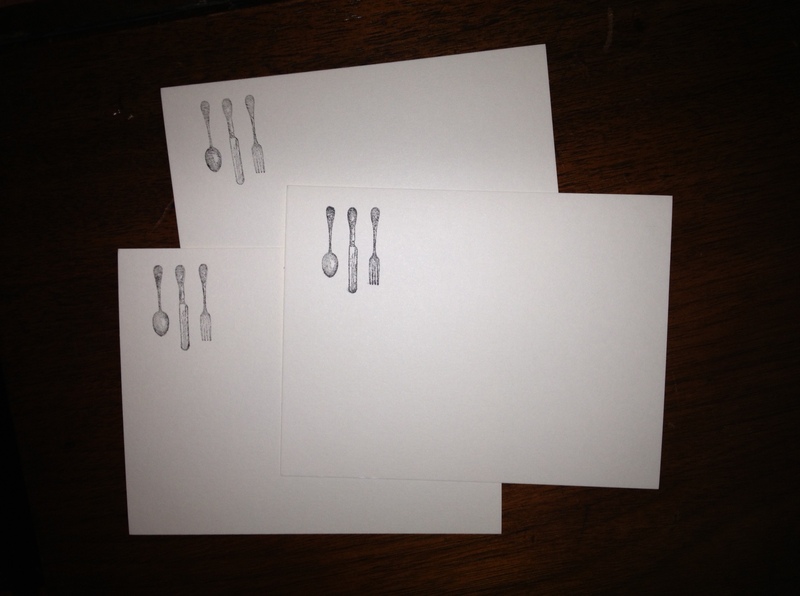 As a part of the invitation, I included recipe cards, so the guests could share their favorite recipes as my friend builds her own collection. You can always buy recipe cards, but they often look hokey to me. I opted to make the ones I sent out with – you guessed it – a stamp! I used the same paper source cards that I used for the Christmas party invitation, but opted for a different stamp and placement. The results are below. Not bad for a days work. Next up, I’m trying my hand at gift tags. Stay tuned for that update.